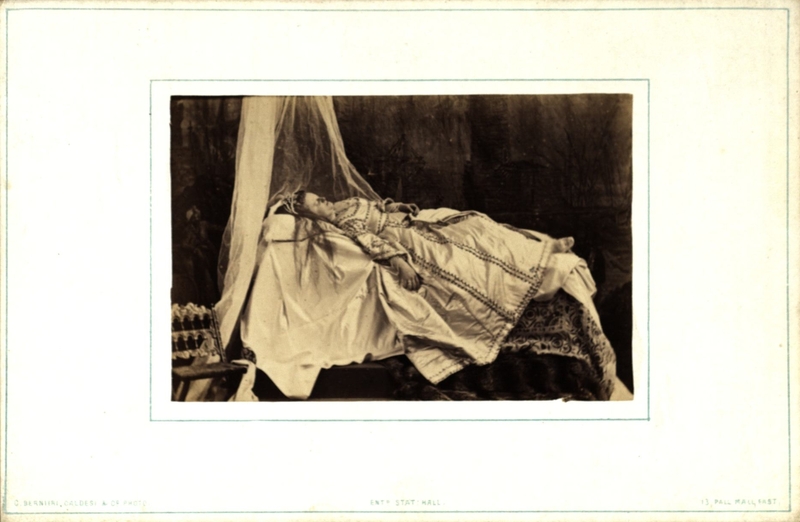 The University of Sussex has recently acquired a fascinating album of nineteenth-century tableaux vivants photographs, now being held at the Keep. Dating from an 1869 charity tableaux event held at the home of Lady Winifred Mary Howard of Rutland Gate, London, the album contains 12 beautiful albumen prints of fashionable members of the aristocracy in an assortment of fancy dress scenes. Subjects for the performances include ‘Sleeping Beauty’, ‘Fair Rosamund’, ‘Guinevere’, scenes from Watteau and ‘Babes in the Wood’. Existing albums like this are very rare, though contemporary reports suggest that they were a popular way to raise additional money at charitable tableaux events, as a supplement to ticket revenues. There would have been multiple copies of the album, which was available at the cost of one guinea, and which would have been available to purchase by the audience and participants of the event. Tableaux vivants, a kind of static theatre in which men and women posed to represent famous paintings, or historical or literary scenes, were a very popular art form throughout the nineteenth century, both on the professional stage and in domestic, amateur settings. The Rutland Gate album offers a rare glimpse into the world of private tableaux events, and show that far from being simple parlour amusements, amateur tableaux vivants could be sophisticated and professional-looking theatrical ventures, attracting royal patronage and participation from prominent members of the nineteenth century art and theatre world (Val Prinsep is among the list of performers at Rutland Gate). 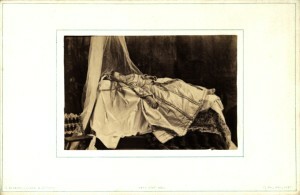 Notably missing from the album are any photographs of Lady Diana Beauclerk, who appeared in several of the group tableaux and by herself as a water nymph in ‘Spirit of the Waters’, a potentially risqué subject for a respectable lady to impersonate. At least one of the many reviews of the event in the contemporary press accused the tableaux of indecency, and this censure perhaps explains Lady Beauclerk’s disappearance. The album is now available to consult in The Keep Reading Room; simply follow this link and add the item to your wishlist.